These Women Will Make You Pack Your Bags and Leave! What in the world is Poorpacking? This is a new kind of travelling – flying in the face of conventions, traversing all kinds of boundaries, making journeys to little-known places away from the tourist treadmill. The Sole Sisters went in search of other worlds that appear both familiar and different, building bridges across seemingly divided worlds. They did not travel across countries, rather they travelled into them – into their societies. They did not have a fixed itinerary but respected the natural evolution of the journey, guided by events, curiosity, intuition. And as they travelled in their independent, resourceful, open way with the freedom to imagine – what they dub “poorpacking” – they created a wonderful collection of subjective impressions, through images and the written word. The Sole Sisters present "From Glampackers to Poorpackers", a travel photography exhibit that chronicles their 6 month backpacking trip in India and across Southeast Asia. On display are 45 photos from all the countries they have visited and videos that recap their journey. This event aims to empower Filipinos by encouraging you to travel and choose your own adventures. Is it possible to reform a self-confessed shopaholic into a poor backpacker? Chichi Bacolod talks about how her love and passion for travel changed her physically, emotionally and mentally. Chichi is the co-founder of the travel site www.wearesolesisters.com. Both Chichi and Lois decided to quit their jobs to pursue their lifelong dream of travel earlier this year. Why do people leave their comfort zones for strange cities and exotic lands? Lois Yasay explores this question and answers them with 5 stories from her recent adventures. Lois is a trainer by profession and a traveler by passion. In 2008, Lois quit her job in Manila to pursue a life in New York City and in Europe. She came home in 2010 and a year later, embarked on 6-month backpacking trip around India and across Southeast Asia. She is slowly realizing her dream of making a living by doing what she loves. Always wanted to travel but keep making excuses on why you can't? 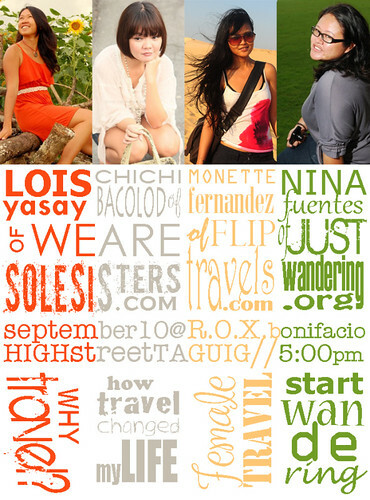 Nina Fuentes shares how she started from a simple goal of "travel more" in 2006 to traveling at least once a month in 2010. Nina is a traveler and multi-awarded travel blogger. She is a Lonely Planet Featured Blogger and her blog justwandering.org was recently awarded the Best Travel Blog by the Philippine Blog Awards 2010. In 2006, Nina made a life changing decision. While her peers are busy climbing the corporate ladder, getting married or popping out their third child, she decided to go out and travel. Since then she has been to Batanes, El Nido, Laos, Myanmar and Australia. Is solo female travel as crazy and dangerous as it's hyped up to be? Monette Fernandez walks you through the life of a female traveler on a more colorful road beyond the shades of pink and pastel. travel the world one payslip at a time and share their experiences on flip'n travels. Our host for the evening is Karen Rigoroso of Shiny Happy Karen and Bob Montano. Have we convinced you to pack up and go yet? Sign up for this Travel Talk session here. Check out the full details of this event as well as other travel talk sessions here. Please share this with the world by clicking on the buttons below. *Big thanks to Harry Kawanda who created the 'movie poster' image.